So, another update on the beaded bag... I've not posted for ages, but I've not done anything to my bag for ages either; I'm catching up on what I've done over the past month or so! So, I've moved on from beading around the sparkles, to filling in the spaces in between, and I have branched out and tried a new stitch... boucle stitch. It is essentially a lot of little picots, so it adds amazing texture. Yes, it uses more beads, and is going to make the handbag exceptionally heavy, but I think you'll agree it's worth it! This is the first shot which actually gives you an idea of what the finished bag will look like. 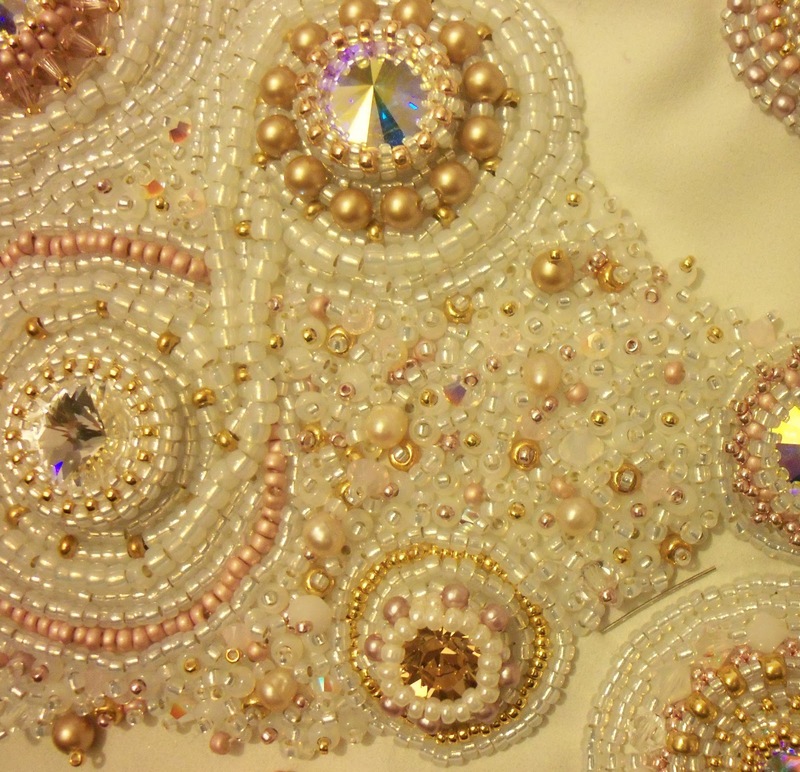 Full of sparkles, fresh-water pearls, and other shiny bits and pieces. I've now decided that I won't be having flowers on my wedding day, and this is going to be in their place. On the blog of a very good friend, she offered the chance for three lucky people to receive a handmade gift from her in the next 365 days, on the condition that they offered people the same chance, either on their blog or facebook. I was lucky enough to be one of the three... so I am giving you the chance to receive something handmade from me. The first three people to comment on this post saying they would like to take part in this will be the recipients. The handmade thing doesn't have to be jewellery, it could be a handmade card, a painting or sketch, a cake... anything really, as long as it's made by you!